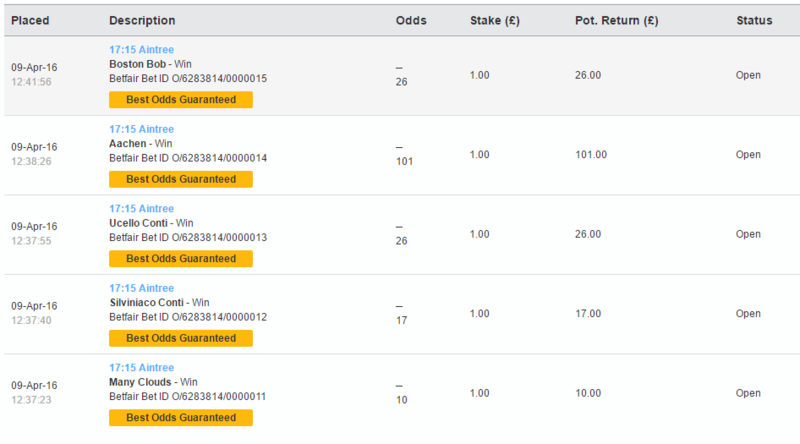 Following on from my absolute disaster yesterday, I almost never put a bet on today. If I didn’t have bad luck, I’d have no luck at all. Good luck! You’ll need it! 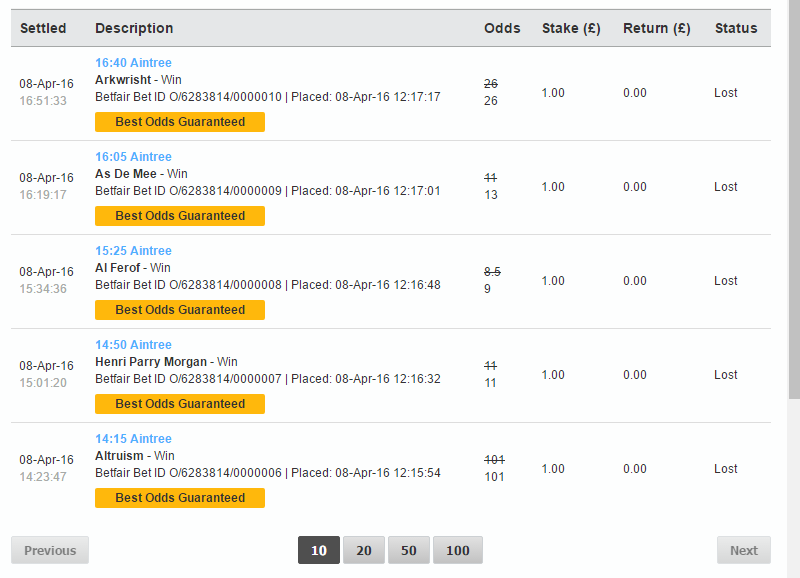 UPDATE: If you backed any of those, even each way, you’d have came out penniless. Oh well. Here endeth my Aintree updates. And now, back to stony silence for another several months while I think of something to post about. I did intend to just post an update on the previous post, but I went on a bit longer than I intended. As expected, my fiver went down the pan. Thankfully, my horse in the Topham chase made it all the way round, unlike two poor horses who may, or may not have left Aintree on the back of a dog food lorry. Admittedly, it wouldn’t have been so bad if the Grand National is based in France. Any horses that get put down can just get shipped off to the local butchers. It did leave to one of those “Oops” moments on Channel 4 though. Naturally, the fall looked rather nasty when it happened, and so Channel 4 omitted Becher’s Brook during the in-depth replay that they have. Someone in charge of the slo-mo tape machine must have got their fences mixed up though, as when they said “And onto Valentine’s”, they cut to a close-up of the fatal incident. Whoops. Takes me back to memories of the 1989 Grand National, where the late Julian Wilson commented that they were omitting Bechers Brook due to a “dead horse”. Let’s hope they go and quickly do some training before tomorrow. Usually, I don’t watch the Grand National itself while in the house. Last year, I was in a random pub in Manchester. Unfortunately, this year, it looks like that isn’t going to happen. I shall be watching the race in front of the telly, and I presume the laptop. I’ve yet to pick out my horsies. I’ll probably do that in the morning. I think I’ll just go for a random five. Oh, and because it’s not exactly necessary, but I’ve already uploaded it, here’s the worst betting slip in history.